My father, he would have been 101 this month. 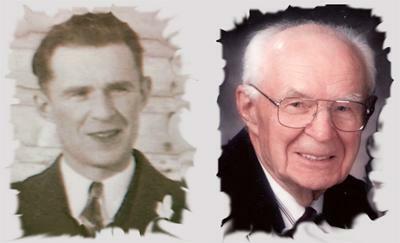 Born on November 25, 1912, passed on November 6, 2004. Remembrance Day always brings him to mind. He was stationed at Point Grey in Vancouver before being sent off to England just before the war ended. Ah… warm memories of his voice, muted temperament, mannerisms. How through this quiet ponderation I am my father’s son. The picture: his vibrant, not-yet-experienced-war smiling face. This is of him arm in arm with my mom on their wedding day in the late 30’s. Then the other, the only way I’d ever known him: a tired smile, bend and weary from a decades-long burden of supporting a family and the ring of white hair. The barber, fisherman, my father. At times, to think of him is to pour salt into a wound; at others, it’s a soft breeze. But always in this time of the year, a persistent, dull ache pierces me.